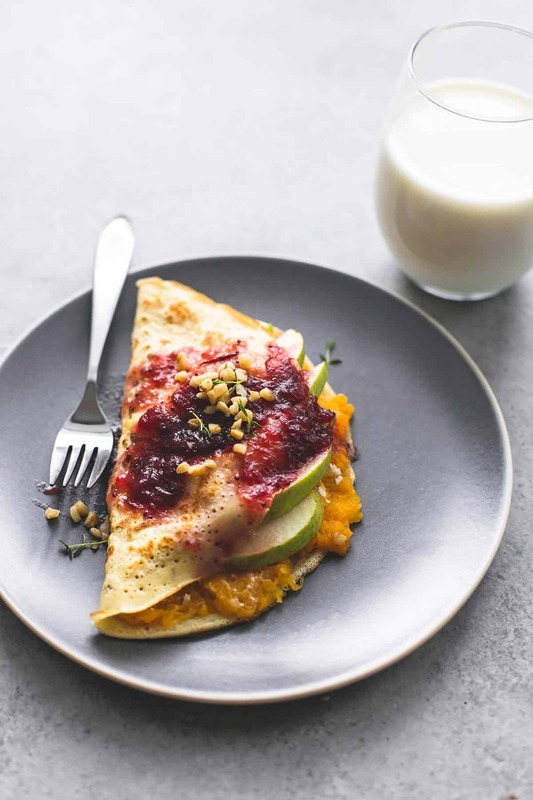 Simple butternut squash & pear crepes with cranberry sauce make a delicious Fall breakfast or brunch. Here where I live we get pretty extremes in temperature. Really hot summers, very cold winters, and everything in between. In the depths of winter when I am scraping ice off of my car’s windshield I always curse Utah for having such harsh winters but the truth is that if I ever moved away, I’d miss it because I love having four seasons. I love having four mini-wardrobes, but even more than that, I adore the seasonal change in foods and Fall flavors just might be my favorite, especially when involving breakfast. For me breakfast really is the most important meal of the day. I am busy busy busy and I need to hit the ground running when I get up in the morning so a good, hearty and delicious breakfast sets the tone for the rest of my day. When my breakfast includes Fall flavors like butternut squash, pears, goat cheese, and cranberry, paired with an 8-ounce glass of milk, I know it’s going to be an awesome day. I used to struggle with fitting breakfast into my morning routine – I am not a morning person and I am definitely a snoozer so I just don’t have a lot of extra time to devote in the AM to cooking, particularly on weekdays. 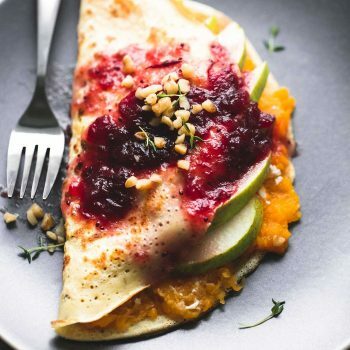 The great thing about these butternut squash and pear crepes is that you can prep the components in advance and assemble the crepes in the morning. Just prepare the crepes, the filling, and the sauce separately, and keep them in the fridge overnight. In the morning just heat them up and assemble your breakfast in a matter of minutes. Pairing a glass of milk, with its high-quality protein, with your breakfast is an easy, delicious way to get more milk into your diet and since all varieties of milk are safe, wholesome, and naturally nutrient-rich, milk at breakfast is a choice you can feel good about for yourself and your family. 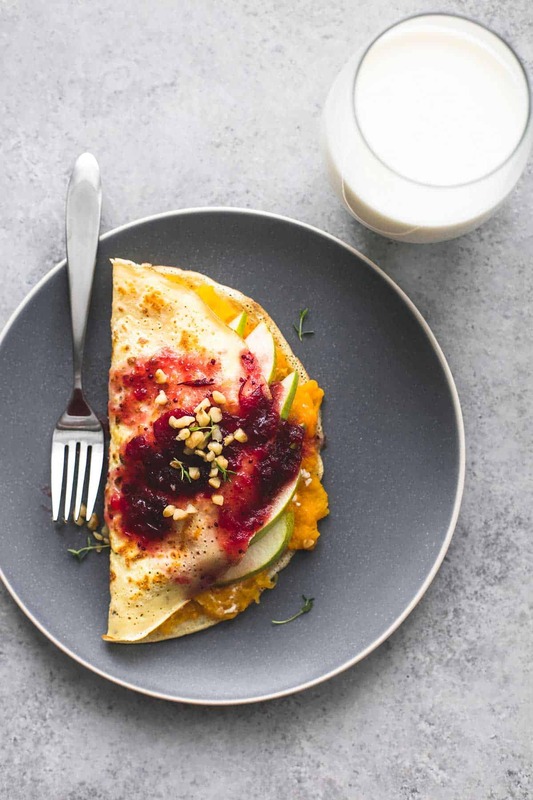 If you are a Fall-flavor-lover, you need these butternut squash and pear crepes in your life. A little sweet, and little savory, a little tart, and a LOT delicious! In a large bowl combine flour, 1/2 teaspoon Italian seasoning, 1/4 teaspoon salt, and 1/4 teaspoon pepper. In another bowl whisk together eggs and 1 cup milk until well blended. Add wet ingredients to dry ingredients and whisk until smooth. Cover and let sit for 30 minutes. Preheat and lightly grease a large skillet. Pour 1/4 cup of the batter into the middle of the skillet, then tilt the skillet in a circular motion to get the batter to spread into a large, thin disk. Allow to cook 45 seconds to a minute until golden and the top of the crepe begins to look more dry. Flip, and cook another 30-45 seconds on the other side until golden. Repeat with remaining batter. Melt butter in a large pan over medium heat. Add butternut squash, garlic, remaining Italian seasoning, remaining salt, remaining pepper, and sauté until squash begins to brown. Add water, cover, and cook for 7-8 minutes until squash is tender. Drain any excess liquid and transfer squash to a bowl. Add goat cheese to bowl and smash squash with a fork until blended with cheese. In a small sauce pan combine cranberry sauce and orange juice and stir over medium-high heat until blended and hot throughout (about 2-3 minutes). Remove from heat. Assemble crepes by filling each crepe with squash and cheese mix, and pear slices. 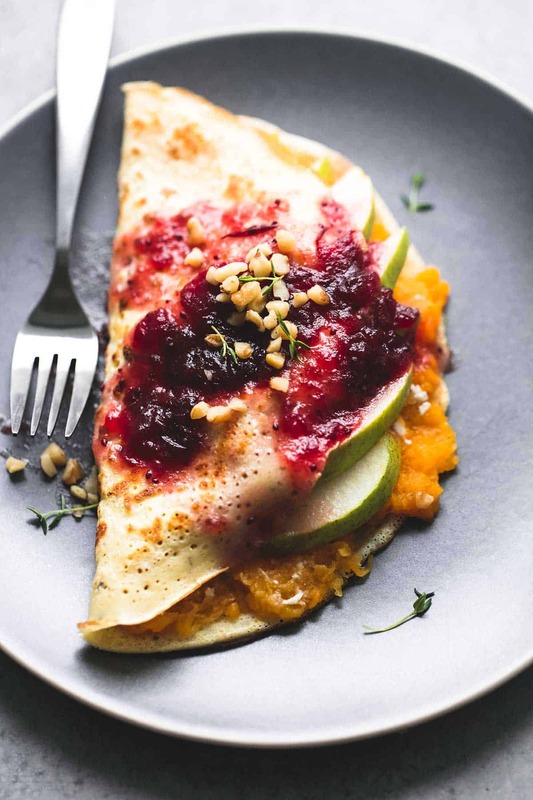 Fold crepes in half and spread cranberry sauce over the top half. Sprinkle walnuts and herbs over the top and serve with remaining 8-ounce glass of milk. This post is in partnership with Milk Life. Follow Milk Life on Pinterest, Twitter, Instagram, and Facebook for more tasty Fall recipe ideas! I think these crepes will be absolutely delicious but am I missing reading directions for how to cook the crepes themselves after the mixture has rested for 30 minutes. I’ve read the directions over several time but don’t see that part. I am also wondering how many crepes this recipe makes and how many one would eat for a serving. Love your blog and Thanks.